Owlcat has put out a new patch and a free DLC! It adds some new spells and scroll merchant to the capital. Cool! Some new spells and a new pet with improved dragon models. Looks like wizards won't have to worry about finding scrolls anymore. Gosh darn can't wait to do my full run of this game. Just waiting for all patches and DLC XD. It might overtake NWN2 as my favorite D&D-based game. There's also an open beta for v1.3. I still haven't had time to read all the changelogs for both phases of it. 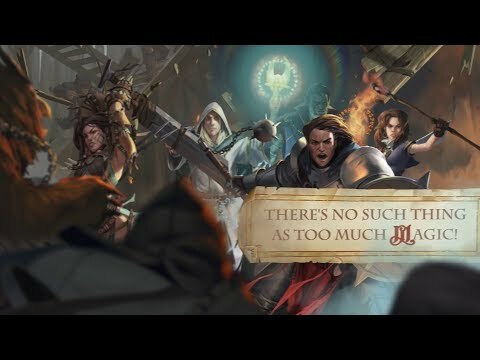 Hey P:K fans, the Owlcat devs have apparently started pnp playing a new Pathfinder AP. You may or may not know that the team pnp played the heck out of the Kingmaker AP prior to that project being announced. Damn, the list of changes for the 1.3 beta is huge, but the thing that really stuck out is that it'll now be possible to go straight to the world map from the throne room. I think I'm going to pass on this beta, since I was a guinea pig for 1.2. The Sacred Grove building was too restricted by the requirement to be adjacent to the Monolith. Resolution: fixed, now Sacred Grove receives an additional bonus while being adjacent to the Monolith. I think it doesn’t change the conditions of actually having the building though. There never was a requirement to have a monolith in order to build a grove. The requirement was that the grove be adjacent to a monolith. Anyone know whether that jelly in lady Jamandi's secret treasure room is random? It spawned only for some of my characters. No, it's always lime flavoured. Seriously, it's the chair, and it only attacks if you go close enough. It's possible to loot the room without waking the ooze. It's also only in one of the two treasure rooms. Guys do you happen to know if (when?) Pathfinder Kingmaker is going to be released on consoles? PS4 is my main gamimg plarform these days and I'd really love to try it out some day. I've seen couple of "let's plays" on YT and I must say, PK looks really great. I can feel BG vibe way more just watching it than while playing PoE myself. I think that will be hard to port to consoles. I mean, an bar with dozens of skills for each party member will be really hard to work with a controller. I never get this. One joystick can be configured to be a mouse and you can use that to select stuff. That said, I am not a fan of Kingmaker’s UI to begin with. You really shouldn’t compare a game that came out 20 years ago to a game that came out recently. I don’t mind NWN because it has the radial menu. Kingmaker gets too clutterful especially with the side panel. It gets repepetive with the spell/ability interface above the quick select and they do not do a good job of organizing the spell slots. They should seperate each casters spells IMO. I might like it more if it didn’t auto fill everything. There's actually an option to turn off auto-fill, I always make sure it is off. If anyone hasn’t seen, there is a survey about the game up on Steam. It is mainly about AI, and consoles. Should i purchase the DLC's? I played the game long time ago(din't finished) and wanna play again. That's not an easy question, and it really depends on how flush you are for cash. The DLCs add some nice stuff, but it's a lot less, in proportion to the size of the core game, than something like Tales of the Sword Coast or Throne of Bhaal. * Kineticist. It's another option in a game that is already stuffed with options. You never feel "what my party really needs is a kineticist". * Tiefling. Like Aasimars it's a bit more powerful than the basic races and has a lot of subrace options. * New companion: Interesting story (about 3 areas) and likeable enough, but power wise might find it difficult to earn a regular place on the team. * Varnhold quest. Largely consists of a dungeon not quite as big or as deadly as Durlag's Tower. Focusses on "you are the companion, not the protagonist" gimmick. Doesn't add any really awesome loot for the main game, but it makes for a change of pace if you fancy playing a different character for a while, or yearn for Icewind Dale build your own party gameplay. The serious bugs have been fixed for quite some time now. I actually think the resting mechanics are the best (as in closest to PnP) that I have ever seen in the genre. I love the rest mechanic. It replaced the press this button to recharge with something meaningful and with banter. Can they pick that ridiculous deadly earth infusion? I haven't had the time for another playthrough yet, so I didn't get to the new companions, just tinkered a bit with the class itself. Haven't come across "Deadly Earth" infusion yet, but there is no reason why they shouldn't pick up Earth as their second element at level 7.